Octopus with spicy chilli and garlic sauce is one of easy and tasty octopus recipe. Octopus had been a used for human consumtions from centuries ago in many cultures. Whole octopus are edible, but the leg parts are mostly used. 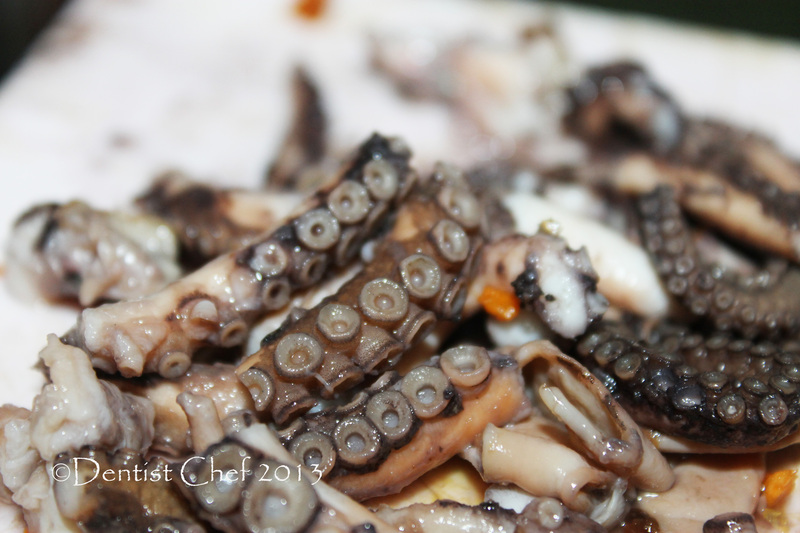 Octopus is a common ingredient in Japanese cuisine, like takoyaki, and akashiyaki. 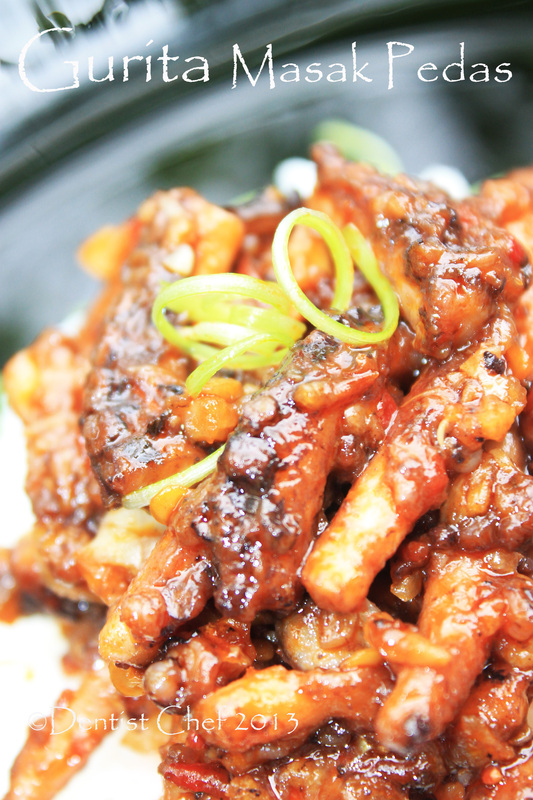 In Korea, baby octopus are eaten alive as a novelty food. A live octopus is usually sliced up, and it is eaten while still squirming and moving. Octopus is considered as a good source of food for according to the USDA Nutrient Database (2007), cooked octopus contains about 139 Calories per three-ounce portion, and it’s a good source of vitamin B3, B12, potassium, phosphorus, and selenium too. How to cook octopus technique is a little bit tricky, i thought the octopus should be cook quickly to prevent overcooking like squid, shrimp and mostly other seafoods. Internet searching lead me know that i’m totally wrong about it. 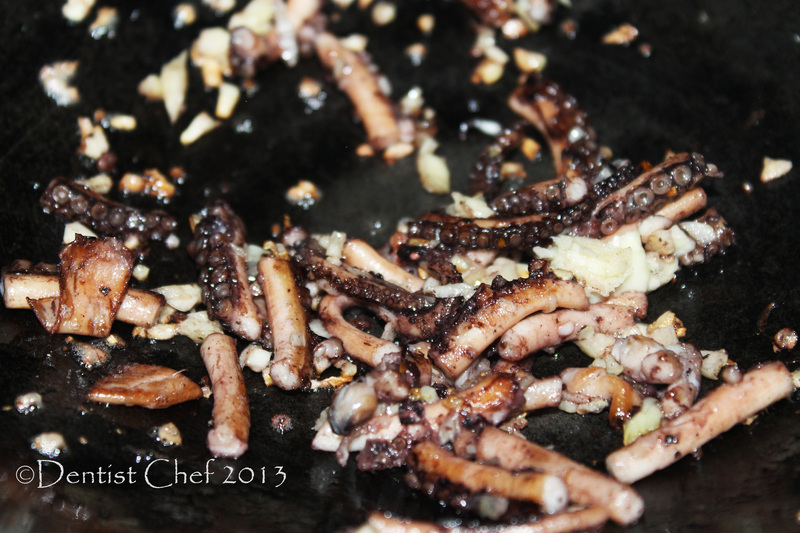 Octopus should be cook slowly with a low heat to make it tender but the texture is still chewy and slightly crunchy. 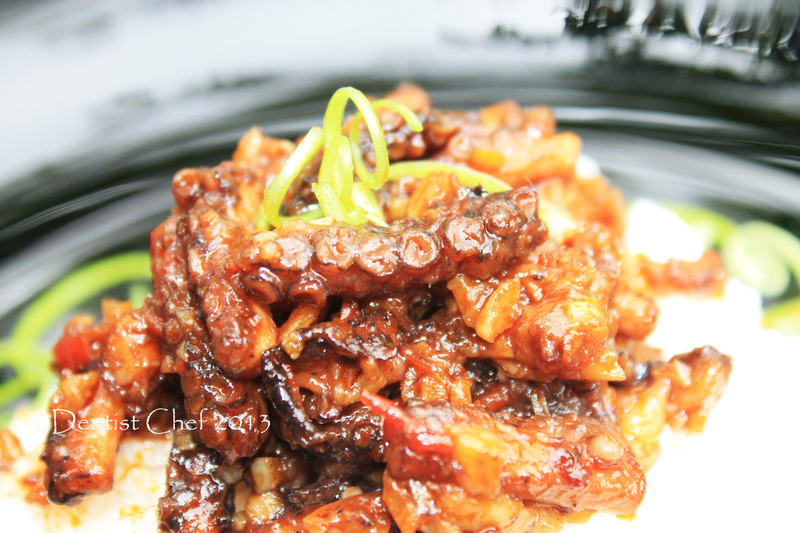 Simply quick stir fry will make the octopus rubbery even more, but when you deglaze it with water or stock and continue to cook it slowly or simmering, the dish could possibly impressed you. The other important things is how you clean and prepare the fresh octopus before cooking it. First you should inspect the octopus head, weather it alrealy got insicion or not; look for the ink sack weather it’s already removed or not. If you’ve hold the unprepared octopus, you should remove the ink sack in the head first by making an insicion under the eye carefully to prevent puncture the ink sack. After that, you can clean it with running water to remove the slime and then cut it. The head also got a hard part surround the eye and it should be removed too. Actually i’ve never seen any fresh octopus in Palembang before. I’ve actually had a pickled baby octopus before, but never even had a chance to cook it. Even the octopus taste nothing special but similiar to cuttlefish, i’m so tempting to cook it, so then i go some reseach and found the octopus online shop and purchased it here. Since i’m not quite understand about quarantine and so many customs regulation and other following procedure when i want to bring it to palembang alive. The seller humbly ask weather i want to purchase it semi dried to make it possibly send in one day without being ruined. Lucky me, i can hold the semi dried octopus now and cook it with spicy chilli and garlic sauce. Btw, i continue to sun dried the rest of the semi dried octopus to make it last longer and try another recipe with octopus. Malbi is a sweet curry stew that consist a rich spice with a sweet and slighly tangy after taste. Malbi is a herrtitage recipe from Palembang, South Sumatra Province in Indonesia. 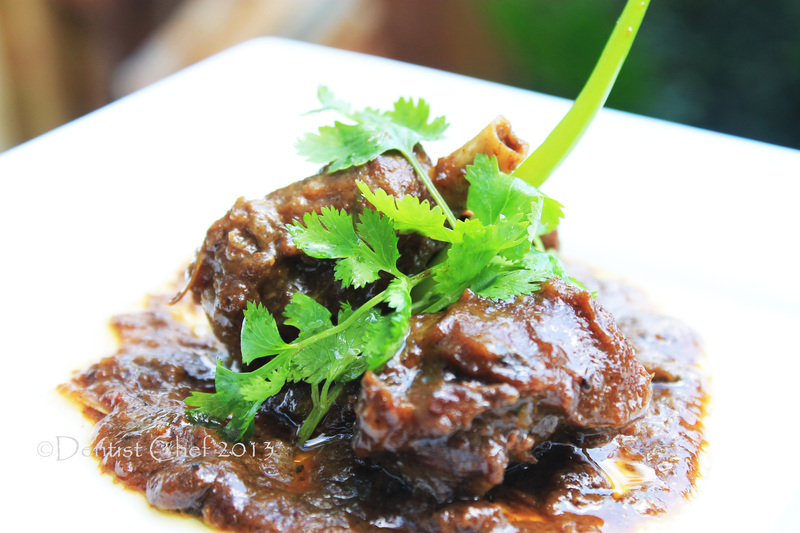 Malbi is similiar to Smoor (Dutch) or Semur (Indonesian) that usually made of beef. 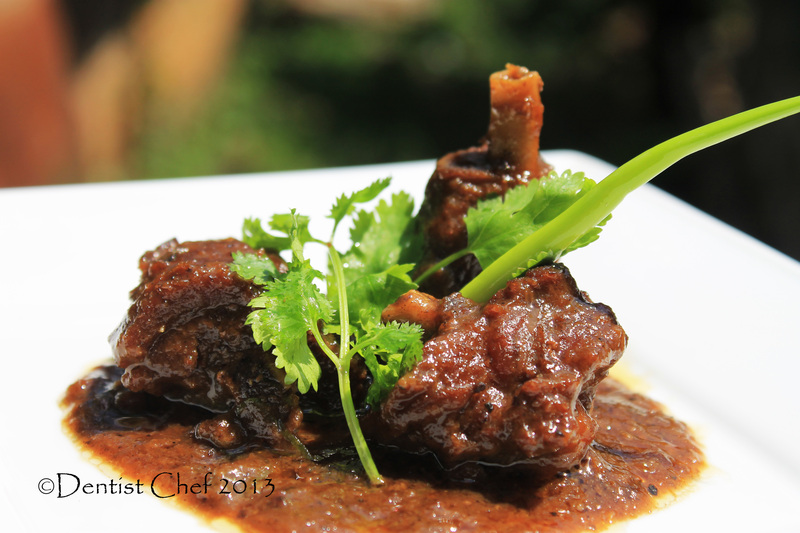 Slightly different with my Semur Daging Sapi (Indonesian Braised Beef Shank in Sweet Soy Sauce), Malbi contains coconut milk and much more richer spice, while Semur is more peppery. Despite the common taste of malbi, i like it even more with rather peppery and tangy aftertaste. The sweet taste comes from kecap manis or sweet soy sauce and palm sugar while the tangy or polite sour after taste comes from asam gelulur or dried sliced Garcinia atroviridis. You can replace the asam gelugur with tamarind paste or lime juice. Malbi ayam or chicken sweet and tangy curry cooking technique is similiar to Kalio (Brown Rendang or Stewed Beef in Spicy Brown Coconut Curry). 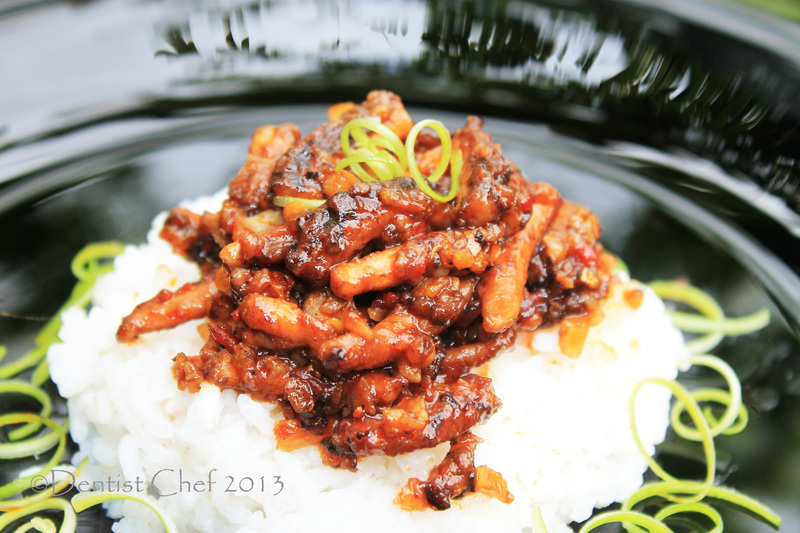 The chicken is stewed or slow cooked with a constant gently stirring to prevent the spices burned out. Gently heat is needed to make the coconut milk got caramelized and formed a thick and oily broth. 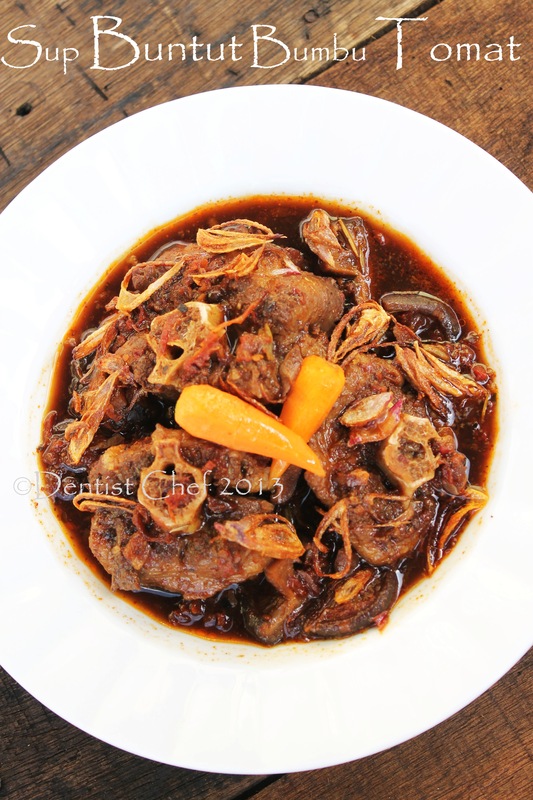 Just like other typical Indonesian dish, this sweet chicken curry is usually serve with a lot of deep fried sliced shallot and chopped spring onion. 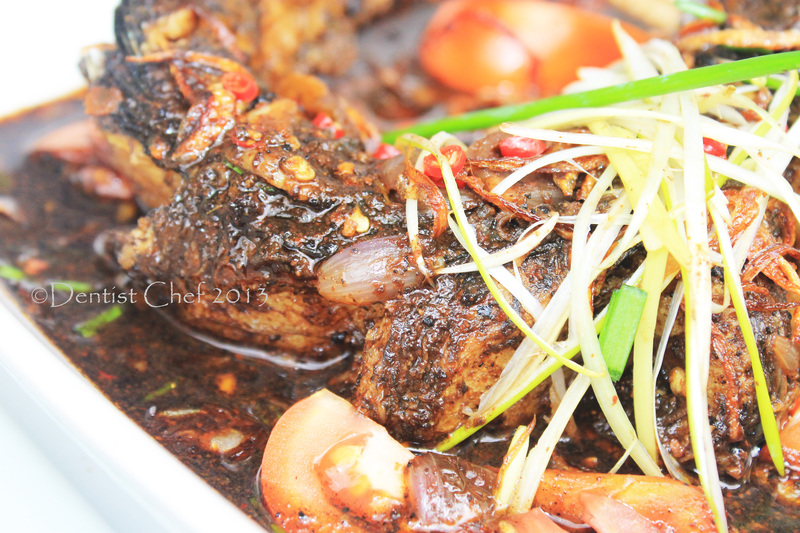 I like to make sweet chicken curry with ayam kampung or malay chicken. I like to cut the kampung chicken into a bite size to reduce the cooking time. Since the kampung chicken is leaner and rather though, you need about 1- 1.5 hours to make it tender and needed more if you cut it into regular size. If you using the regular chicken, it takes nothing more than 40 minutes. 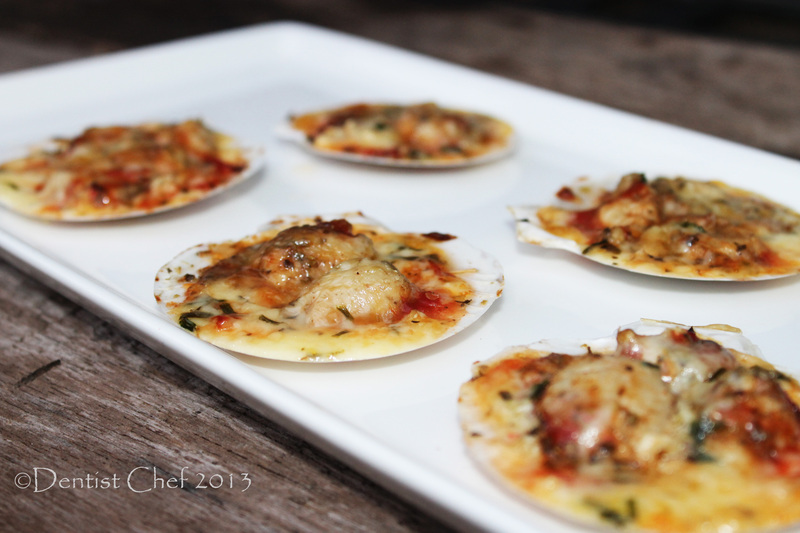 Baked Scallop with Cheese and Herbs on it’s shell or scallop mornay will be a great appetizer on your party. 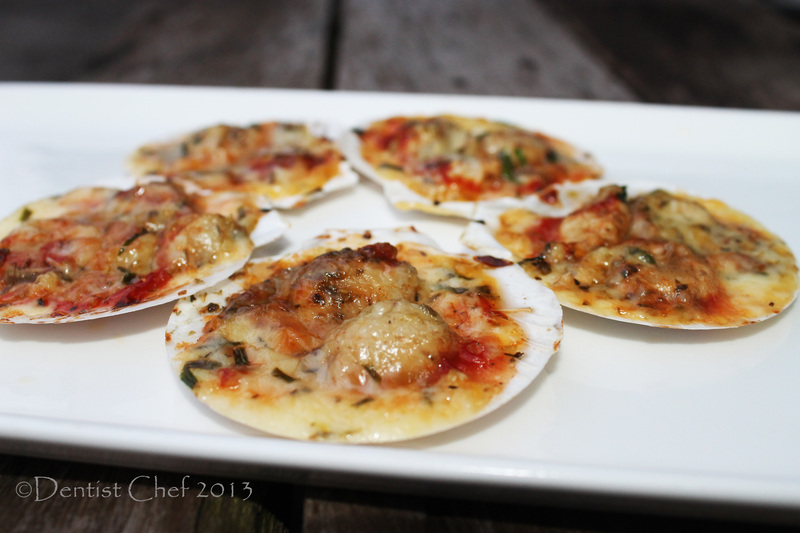 Well, i think the this baked scallop won’t be last longer than other savoury apptizer. 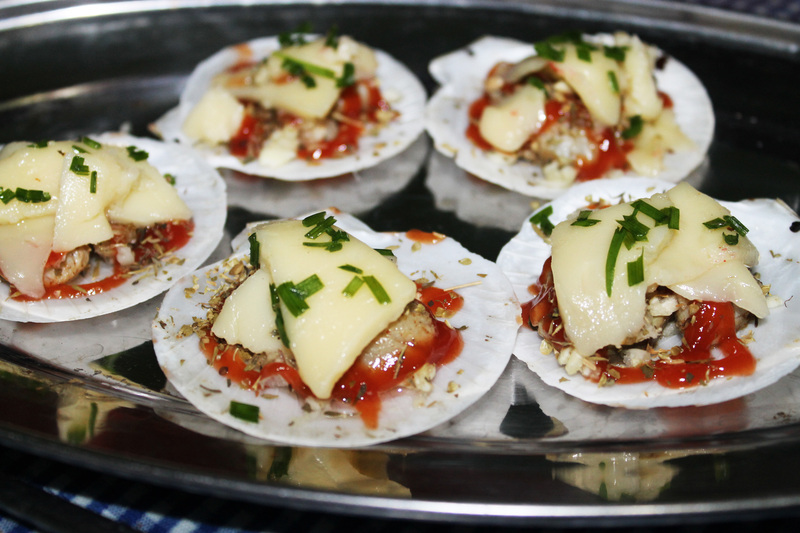 Simple baked scallop with cheese and fragrance herbs with a little touch of tomato ketchup will be an impressive looking dish. Check out the other scallop appetizer that i’ve been posted before, Steamed Sea Scallop with Black Bean Sauce and Served with Rice Glass Vermicelli/ Bihoon, Pan Fried Scallop with Black Garlic, and Grilled Scallop with Roasted Bell Pepper Sauce. 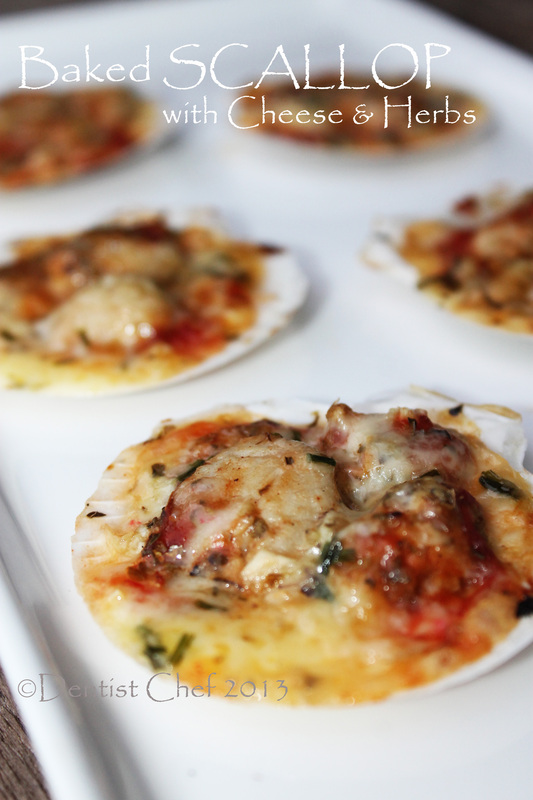 For making scallops mornay, choose the meaty scallops. Actually i purchase 12 live scallop for about 2 USD for each of it with a good expectation of meaty scallop muscle underneath the shell. Unfortunately i’ve got 1 ruined or dead scallop and rather small meat and shell ratio for the rest of it. . That’s why i use 2 scallops on each shell. 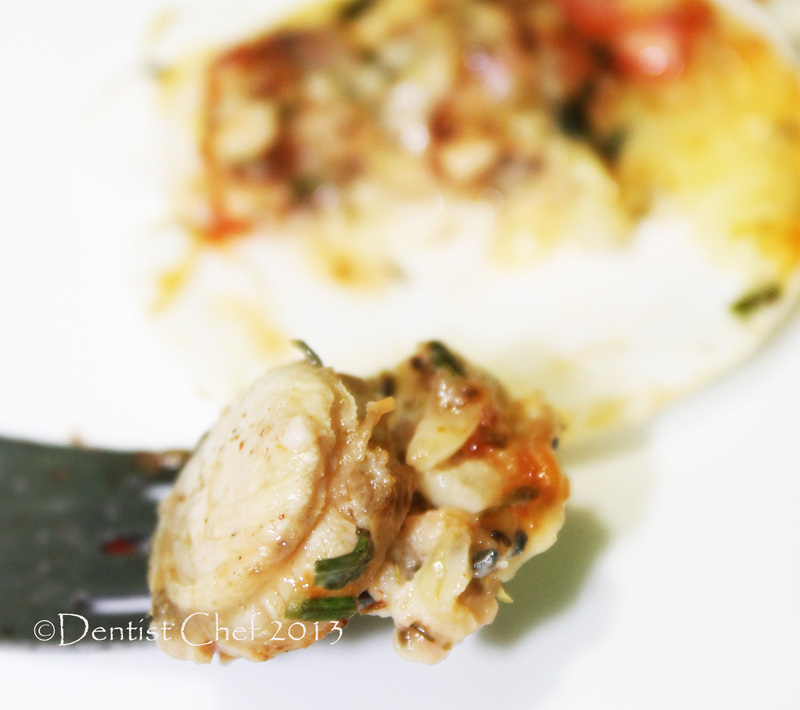 You can see there’s 2 bulging scallop under the melted cheese on the photograph. Btw, if you like, you should keep the yellowish scallop roe becauce it’s edible too. 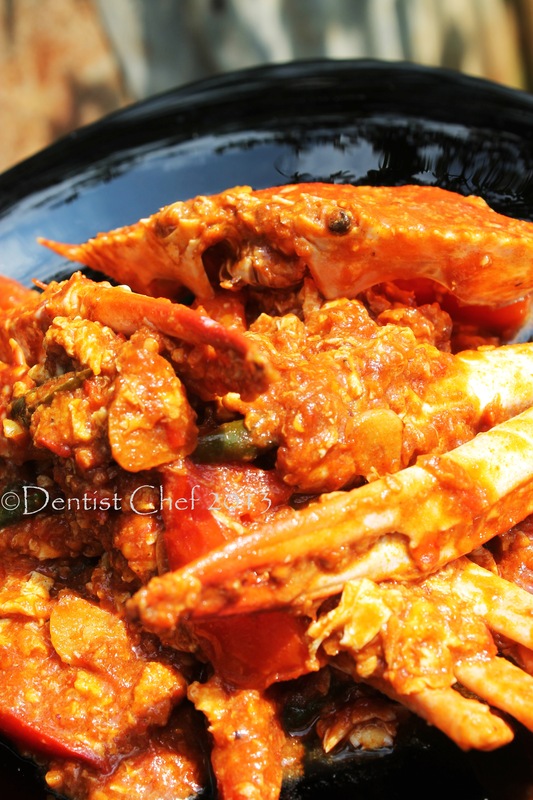 Chilli crab is a popular dish preparation for crab . This hot and spicy chili crab are considered as Padangnese or Minangkabau descent style for it’s kick’in spicy and hot taste. 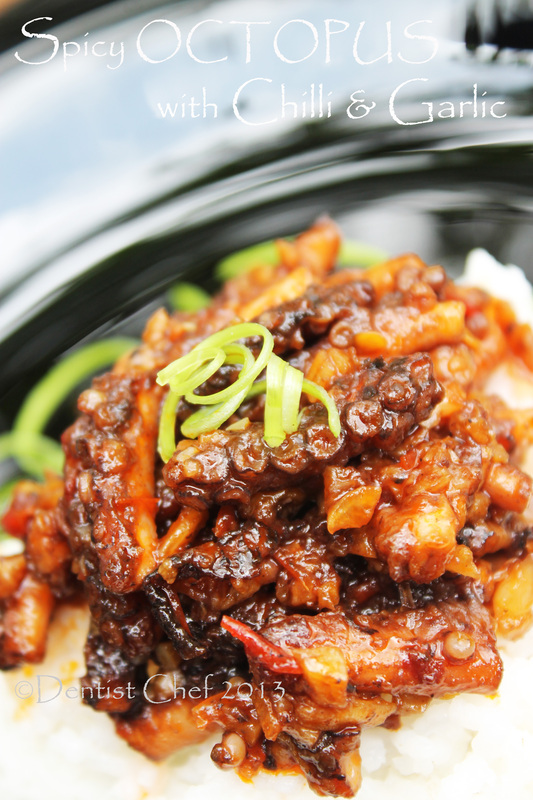 Just like BEEF RENDANG, the chilli crab spice paste contains a dominant chilli flavour. 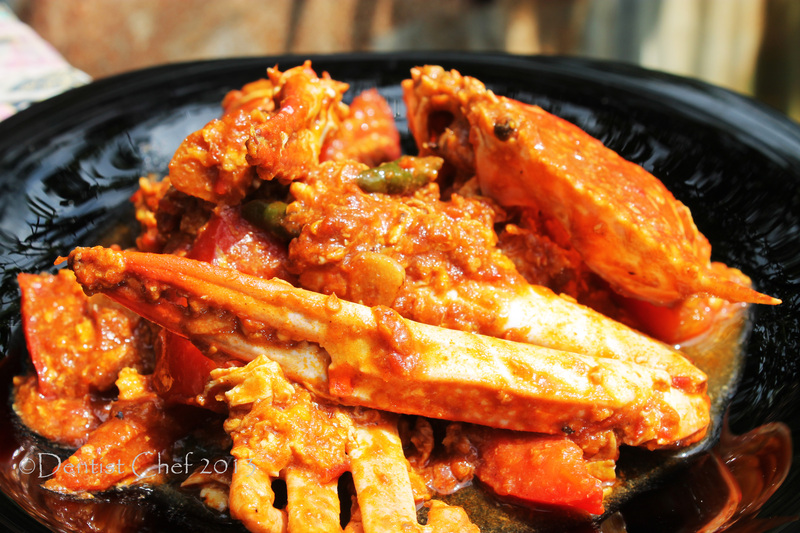 Mud crabs are commonly used and are stir-fried in a semi-thick, creamy, hot and savoury tomato and chilli based sauce. 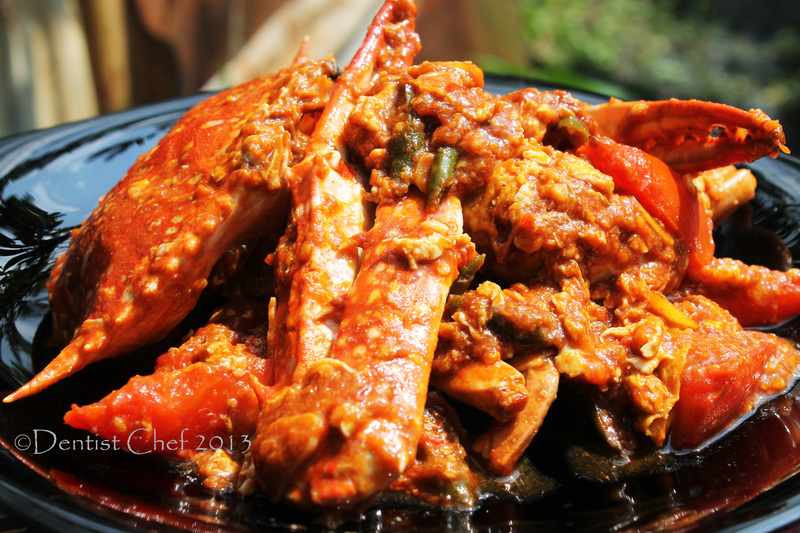 Padangnese chilli crab are slightly different with the relatives, a Singapore style chilli crab. 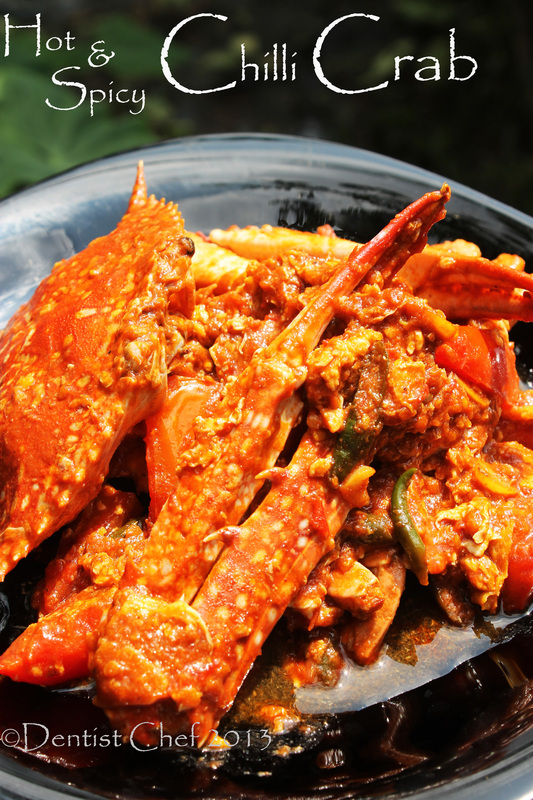 Despite its name ‘chilli’, Singapore style chilli crab is not a very hot and spicy dish. The other difference is the Padangnese style chilli not contain shrimp paste but turmeric, candle nuts and chilli paste. 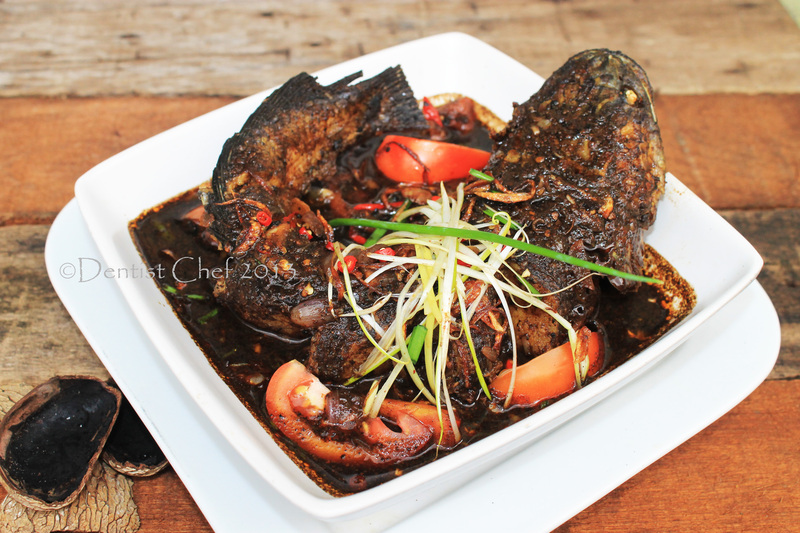 Kepiting Saus Padang or Padangnese Style Chilli Crab is a very popular dish among seafood restaurant through out Indonesia, especially chinese restaurant. The chef usually boiled the crab with ginger and lemongrass or deep fried it before tossed with the spicy sauce. Don’t you ever espect to order kepiting saus padang in a Padangnese Restaurant since it’s won’t be available. To make it even more fragrant, i love to add some curry powder to the dish. A little touch of thick coconut milk added to make a creamy sauce. Instead serving with a deep fried mantau or buns, the Kepiting Saus Padang is served with steamed rice. This Indonesia chilli crab got a little of my personal twist. I use a sliced tomato and green chillies to make it refreshing even more. Beside tomato puree, i use a ripe torch gingger pods that called as buah cekala, kecombrang, kincuang or sambuang in Minangkabau or Padangnese descent language. You should crack open the torch ginger pod and mashed the black seed innard with water, then strain it through a fine sieve. The torch ginger pods and flower are essential ingredients to to make a Arsik Ikan or Indonesian (Batakness) Spiced Fish with Torch Ginger and Szechuan Peppercorn. I was so damn lucky to had the blue crab or flower crab since this is the last stock in the market this weeks. I like this crab for it sweet and succulent meat eversince i made Seafood Paella and Steamed Blue Crab in Green Chillies. This crab is worth for the price since literrary i had to struggling around a bunch of jolly mommy with the same interest to purchasing the flower crab. This blue crab is the biggest i ever seen, about 2-3 for a kilo and it’s very cheep too. I purchased 3 blue or flower crab weighted around 1,4 kilos for about 6 USD. In a large skillet , heat up the oil over medium-high heat. Saute the spice paste until the oil separated int he edge of the skillet. Add the green chillies, tomato puree, kaffir lime leaves, curry powder, coconut milk, tomato ketchup, and chilli sauce. Add the crabs and the torch ginger infused water , bring to boil in a large flame. 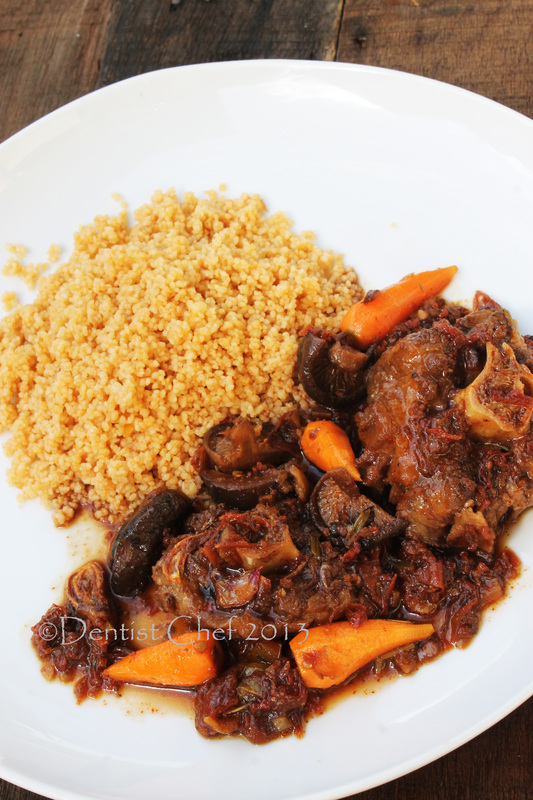 Braised oxtail with red wine, tomato and baby carrot! Braised oxtail in a kick’in tomato soup! the answer that i said once my mom asked what i’m craved before my thesis examination. Braised beef always comfort my days. 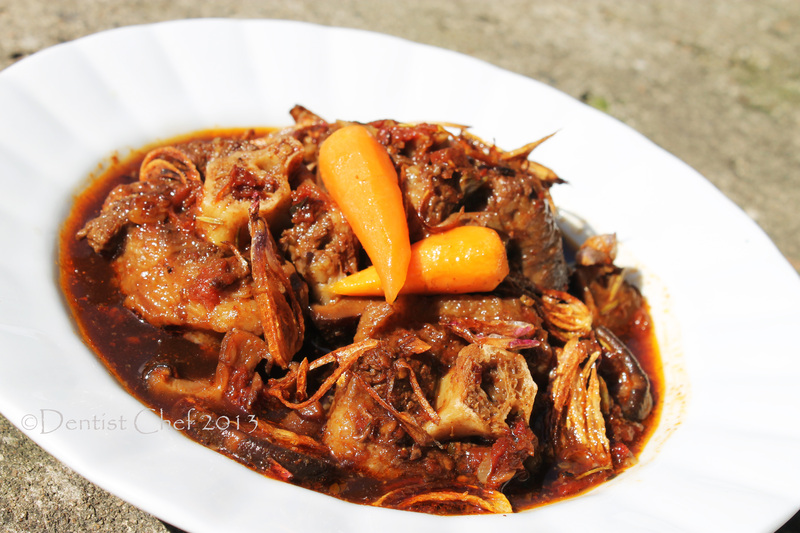 Melted and tender meat with a rich broth can save me from my nervous and forgot a little about the exam that i’m gonna facing up that days.My family is a big oxtail lover and we used to had a clear oxtail soup or semur buntut (oxtail soup with sweet soy sauce). We usually cut it one and a half inches thick and slow cooked it until the meat is suckable instead of chewable. 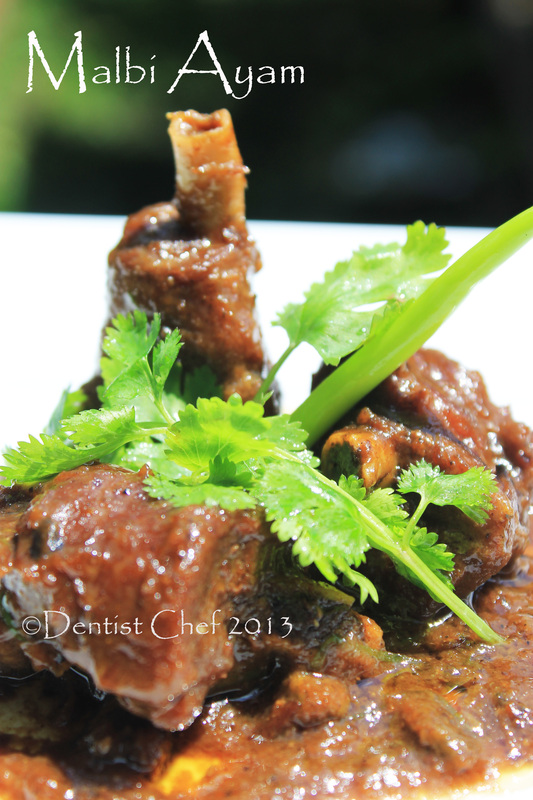 Well, actually the braised oxtail in rick tomato broth or sup buntut bumbu tomat are really works for me. Thanks God that i passed the test with honour. I’m officially become a dentist co-assistant and need to catch up my clinical requirement for next two years to become a professional dentist. Wish me luck within my dental college clinical courses program. I you want to make a rich and a deep tomato broth, you should use sun dried tomato. I use my unblanched homemade sun dried tomato, that’s why the broth got rather dark color. Becarefull when you pour the dark soy sauce into the soup since i pour it without spoon. This made the broth ever darker. Pucung or black nut, kepayang, kluwek, keluwek, keluak, kluak is a wild mangrove tree. The fresh fruit and seeds contain hydrogen cyanide and are deadly poisonous if consumed without prior preparation. The seeds are first boiled and then buried in ash, banana leaves and earth for forty days, during which time, they turn from a creamy white colour to dark brown or black. The method relies on the fact that the hydrogen cyanide released by the boiling and fermentation is water soluble and easily washed out. 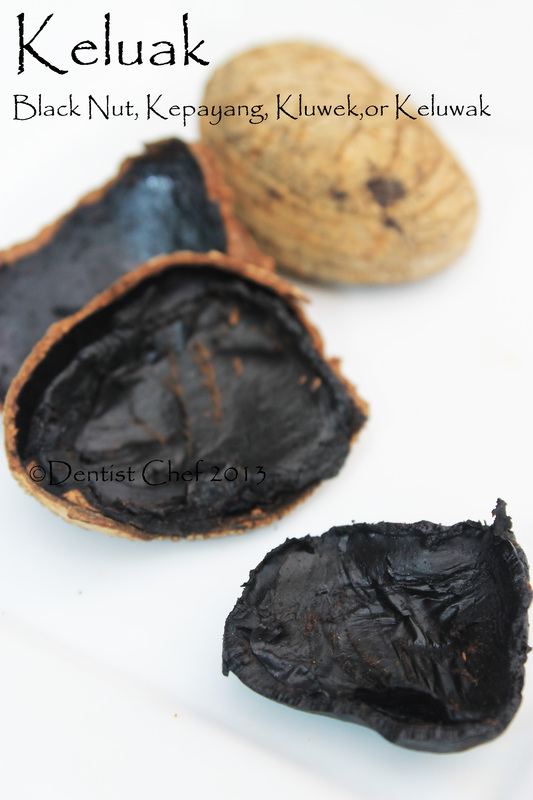 Keluak seed had a hard, pale brown shell with black and soft innard. 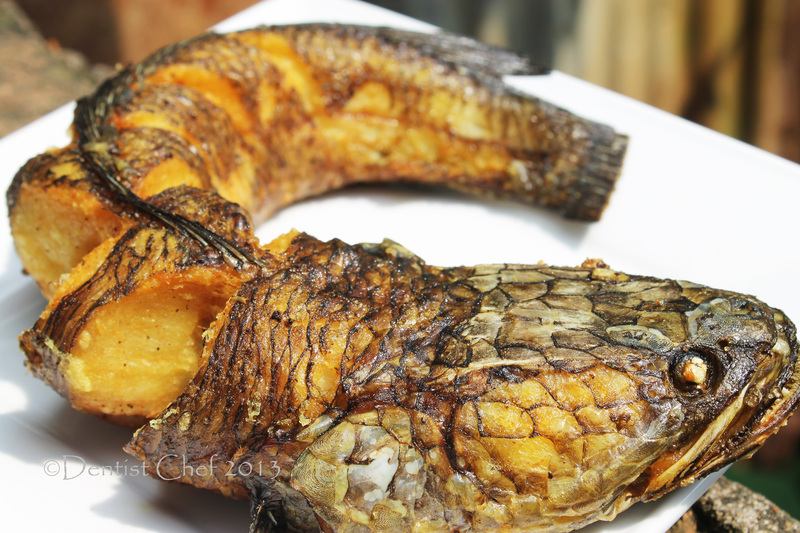 Choose the keluak with black innard and i suggest you to taste it one by one since sometimes it had a bitter taste that can ruined the whole dish. In Singapore and Malaysia, the seeds are best known as an essential ingredient in ayam (chicken) or babi (pork) buah keluak,a mainstay of Peranakan cuisine. Alternatively, the kernels may be ground up to form a thick black gravy called rawon (or rawan in parts of Indonesia): popular dishes include nasi rawonand sambal rawon. 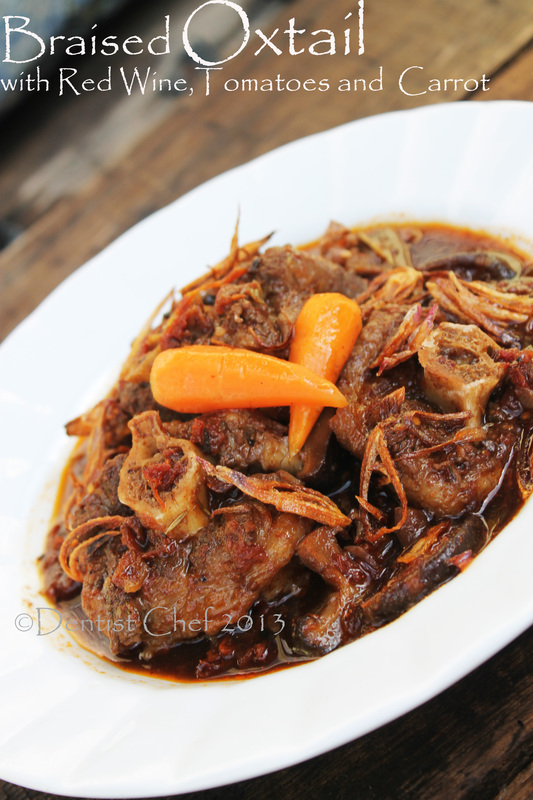 A stew made with beef or chicken also exists in East Java. 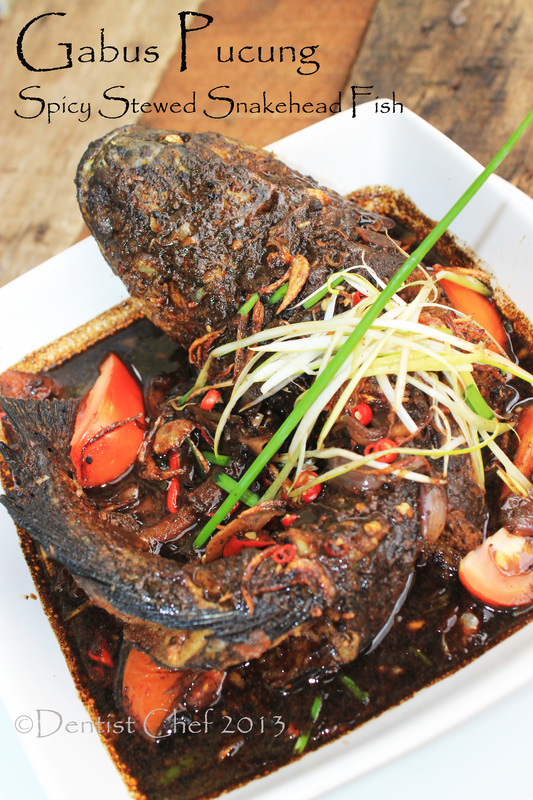 The Toraja dish pammarrasan (black spice with fish or meat, also sometimes with vegetables) uses the black keluak powder. Process the fish paste until smooth consistency, set aside.